The secrecy surrounding Kylie’s pregnancy was particularly enthralling because – aside from Kim Kardashian-West's break from social media in 2016/2017 – it was the antithesis of the family’s entire brand strategy up until now. The cosmetics and reality TV powerhouse and her family members are the kingmakers of a generation who swap photos and likes for hard cash. Being hypervisible is a means of self-promotion via stylised Instagram pictures, a barrage of brand partnerships, and over-saturation of their public image. So Kylie’s retreat to the personal is perhaps a signifier of a new, “post-selfie” era (maybe she really has “realised stuff”). This media strategy of intimacy, authenticity, and withdrawal articulates a shift in celebrity narratives. It was also a pregnancy announcement with its own aesthetic and film director. 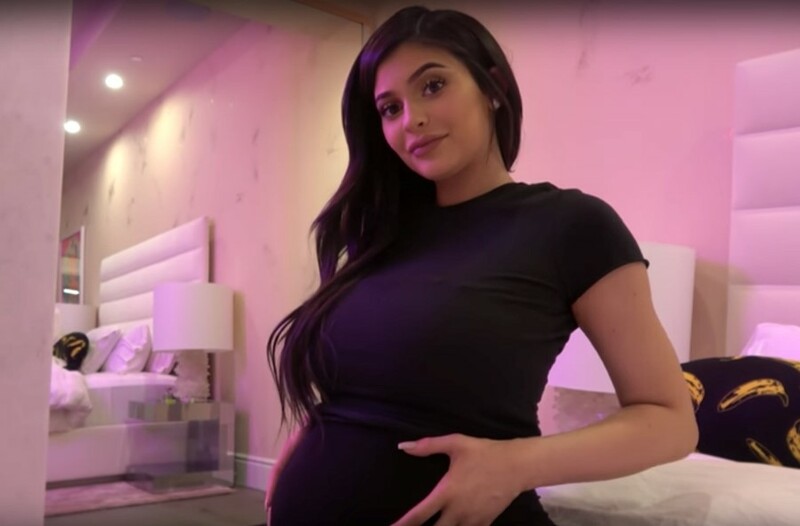 The home-video-style, lo-fi montage Kylie released, titled ‘To Our Daughter’, documented every step of her journey, from Kris Jenner’s labour through to her own. The video is a grainy, handheld 90s throwback incorporating a style Kanye West and Kim Kardashian-West have also been embracing recently (see Kanye’s birthday video to Kim from 2016). Kylie’s tribute to her daughter was made by the same videographer used by the power couple, Tyler Ross, whose found-footage style only adds to the feeling of familiarity, family, and togetherness in the announcement. It’s the ultimate performance of privacy. Although Kylie said keeping her pregnancy secret was not part of some bigger brand strategy, it will inevitably act as one. “There was no gotcha moment, no big paid reveal I had planned”, she wrote on Instagram. But her seemingly private pregnancy wasn’t really private at all. It is illustrative of the ways privacy and intimacy can be employed as skilful marketing tactics. The Kardashian-Jenners have long been at the forefront of social media trends – they made their fortunes by flooding the public arena with photographs, updates, and promotions. Kylie’s birth announcement feels like a turning point, and a reversal of their own strategy. Taking a break from social media, or abstaining completely, could be the new vogue. Celebrities such as Kanye West, Justin Bieber, and Kardashian-West herself have taken conscious time off from social media in recent years, and it didn’t hinder their cultural significance. If anything, it added to a sense of mystery and longing from the public as consumers of celebrity culture; in a world of chatter, shutting up and saying nothing might actually be more effective than hypervisibility. When people are fatigued by over-saturation, limiting public performance seems like the best kind of self-promotion. In her announcement, Kylie also referenced the stress that social media could have had on her unborn baby. Although she’s been a veritable Instagram junkie until recently, she seemingly recognises that the platform is the worst network for mental health, according to a 2017 study. (In her 2017 show Life of Kylie, she spoke of feeling "constantly pressured to keep up with" her image, and needing therapy to cope with life in the public eye.) Instagram is associated with high levels of anxiety, depression, bullying, self-image, and identity issues. Kylie’s concern seems to reflect one we’re all feeling right now: is over over-exposure on social media making us all unwell? The Kardashian-Jenner family will always remain a camera-happy exemplification of celebrity culture in all its forms; adopting privacy and retreating is just yet another savvy way that they have altered the discourse on fame. But it also seems to be part of a wider knock-on cultural effect. As well become more conscious of the IRL consequences of what we share, the way we post online is perhaps becoming more about what we don’t give away than what we do. With Facebook changing its entire business model to make technology more “personal”, and help us have “meaningful interactions” (whatever that means), a turn towards the private and protected feels like the next big thing.